(Nanowerk Spotlight) Being able to fabricate materials that allow a reversible tuning of their electrical and thermal properties near room temperature has many potential applications such as seasonal regulation of building temperature, thermal storage and sensors. 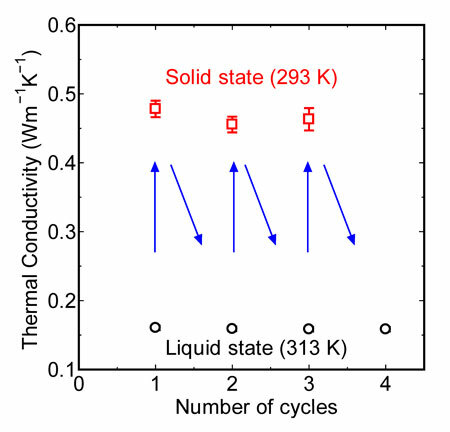 Researchers have already shown that liquid-solid phase transitions can be an attractive route for the temperature regulation of electrical and/or thermal properties because of the availability of materials with a wide range of phase transition temperatures (see: "Reversible temperature regulation of electrical and thermal conductivity using liquid–solid phase transitions"). Because a liquid-solid phase transition usually does not cause a metal-insulator transition, nanoparticles can be added to liquids to control the property contrast between the liquid and solid states. Quite surprisingly, though, researchers found a contrasting thermal conductivity enhancement between solid and liquid states for the same loading of nanomaterial inclusion. "Achieving different magnitudes of enhancement in solid and liquid state is difficult to explain from a theoretical point of view," S. Harish, a PhD candidate in the Department of Mechanical Engineering at the University of Tokyo, tells Nanowerk. "When we made similar experiments in our lab using single-walled carbon nanotubes (SWCNTs) as the additives, we noticed much higher thermal conductivity improvement than the evidence available in existing literature. This is something we never anticipated to happen; when we saw the experimental results we were quite dumbstruck with the enhancement seen. Moreover, when the material is melted back/frozen again the conductivity enhancement can be switched repeatedly." 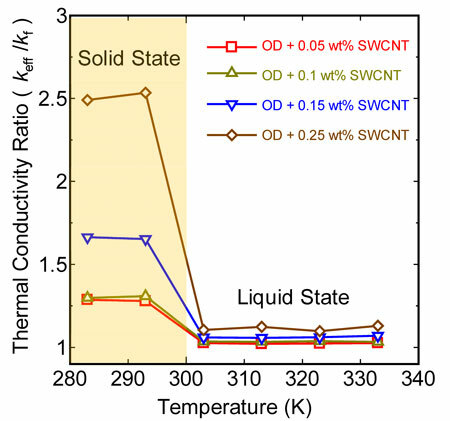 In a recent paper in The Journal of Physical Chemistry ("Anomalous Thermal Conduction Characteristics of Phase Change Composites with Single Walled Carbon Nanotube Inclusions"), first-authored by Harish, a research team led by Shigeo Maruyama, found contradictory enhancements in the thermal conductivity of material just by adding 0.25 wt% of SWCNTs. For instance, when the material is in liquid state, the enhancement is nominal (around 10%). But when the same material was transformed to solid state by freezing, a striking enhancement of 250% occurs. "In our experiments, we found that the thermal conductivity contrast between solid and liquid states increased with increasing SWCNT loading, although we had to limit our measurements to low SWCNT loadings because of the difficulty in achieving good stability at higher loading of SWCNT with the surfactant assisted dispersion method we used," says Harish. "The thermal conductivity contrast was more pronounced in the presence of SWCNTs compared to the presence of exfoliated graphite nanoplatelets reported in the literature. This may possibly be due to the ability of the SWCNTs to induce the formation of stronger crystalline networks than graphite nanoplatelets." He points out that the team's experimental results show an anomalous enhancement in thermal conductivity which classical theoretical models fail to explain. "Our finding will help in the develop of phase change materials for thermal energy storage applications," says Harish. "Since alkane based phase change materials have a wide range of melting and freezing points, careful selection of these materials along with carbon nanotube inclusions will help in the development of advanced energy storage materials and thermal switches." According to the team, possible future directions of this research include the development of metallic alloy based nanocomposites –materials which are often required for solar thermal energy storage applications. However, from a theoretical point of view, this contradictory enhancement and the mechanism surrounding it remains a puzzle which needs to be sorted out before focusing on specific applications.